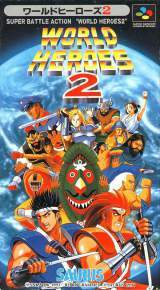 World Heroes 2 © 1994 Saurus. The first battle crossed the barriers of time to find out who was the greatest hero ever, but no clear winner was determined. One year later, those 8 great heroes with 6 new challengers have gathered together to settle it once and for all! Features 14 playable characters with Neo Geegus and Dio, the last two bosses, playable in the VS mode. Same character select so you can pit your hero against each other for the ultimate dream match, 3 selectable speed settings, unique new life gauge "mask", "seesaw" life gauge and new death match stages and experience the new "Counter throw" and projectile "Repelling" features that put this game in a class by itself! 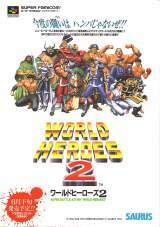 World Heroes 2 for Super Famicom was released on July 01, 1994 in Japan. This version of the game is pretty customizable. You can play it so that all four face buttons can be used, Y and B are for weak punches and kicks, X and A are for strong punches and kicks, and LR used for taunting and throwing. 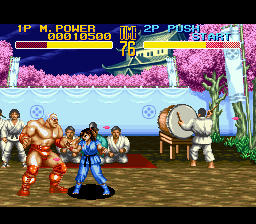 Players can also play the game with the arcade life gauges, which change between Normal and the Death Match, Normal for basic life gauge on either Normal or Death Match, or Seesaw for one fall matches on any stage. Players can even hide the life gauge damage through the "Mask" option. There are also three speed settings to choose from. 1 is slow, 2 is normal speed, and 3 is really fast. Each of the heroes have a total of six costume colors in this game, selected with one of the six buttons. The L and R buttons are for evil hero colors, and the computer uses them when the code (seen below) is used. Neo Geegus and Dio are also selectable in the VS mode, and selectable in the single player game via a code (see below).